Already added. Wait next version. There is bunch of another fixes. Thanks r57shell, so are all the finishing moves are going to appear like they did in the arcade version of UMK3 and MKT for Rain & Noob Saibot, just curious? 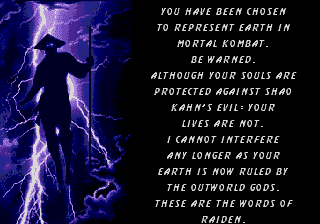 Also will the missing kombat kodes be added as well? They will, but not sure in next version. ATM we have only Noob Saibot fatalities, but as they looks in MKT. And, animalities but they needs remastering. MKPrince, post all differences that you know about. Just, because we don't know everything. Most cool updates: optimization fixes!!! Now you can do Nightwolf two axe combo with air kick! In any area! R57shell, you want me to post differences between the arcade version of UMK3 & the genesis version of umk3 like missing kombat codes, stuff like that? Let's start with differences only in fight(combos, finishing moves, specials) and vs codes. Reports about bugs in same areas in our hack would be nice too. 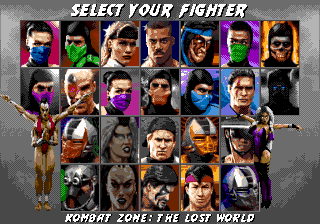 Now I don't believe there isn't a Kombat Zone code for The Bank or The Hidden Portal from MK3 so one would have to be made for them if you will add the kombat zone codes. ok good bunch of info. harpoon move in the genesis version, thus making the move useless against them, needs to be corrected. her staff is missing sound when she bounces on it, other that she is fine. in the Genesis version, if possible could the original fatality be done in the genesis version? much slower in the Snes version of UMK3 and MKT, could his lightning move be slowed down? Sonya arcade friendship - i think we will made this. could rains lightning move be slowed down? this is not necessary. a second player can block the second zipper. Sub zero unmasked - we cant do more body parts..
Cyrax - we cant do more body parts..
we cant do more body parts.. I don't want to commentate all things, and recomend to do you so. 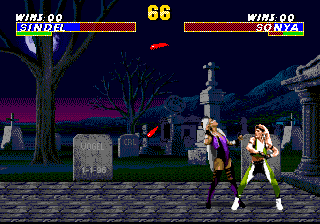 Many of them is already known bugs, like sindel win stance after Animality and Kung Lao missing fatality animation. Just, want to say, that if something will be fixed, then it will be in changelog or in "new changes". Hmm... MKPrince, do you know something about Mercy and Animality done by computer? Is it happens? May be computer can make animality after player Mercy or something else? O_o As far as I know, there is only one finishing move that you can't perform from other side, and it is PIT. Anything else SHOULD work ATM. If not so, then IT IS BUG, NEEDS REPORT. 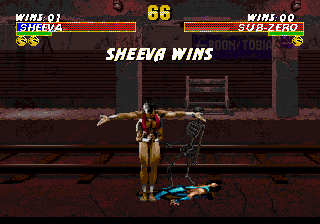 Nemesis I edited my post showing Jade's win pose animation & Scorpion's missing sprite for his toasty fatality, and this is the soul sprite missing from Shang Tsung's second fatality , after the green goo consumes the victim, the soul floats up while the victim body falls to the ground in a puddle, and when referring to Sheeva's animality I was talking about the version of the game that I have, after I seen in your lastest videos on Youtube I see now that's it's been fixed and No r57shell I have yet to see the computer performed an animality in one player mode, maybe in demo mode, but it's rare, the only other glitch I could think of besides Kitana fan toss glitch(when the opponent is hit by this move, along with there scream comes the sound of there main projectile move, but you may already have fixed it too) is fighting the computer in Endurance Mode, I know to have to be quick with holding the buttons to make computer player 2, I know that if your not quick the game will go into 1 player mode with hearing the phrase "toasty" for every match. 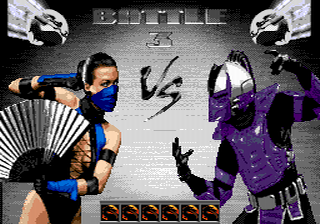 I'm glad to hear about adding everyone stretched sprites for Kitana's Kiss Of Death fatality, I understand you can't program it like the arcade, but I hope you get it is close as possible, hope you can do the same with Scorpion's Pack Fatality, also will Scorpion & Human Smoke will be getting there "Get Over Here" phrase? Just tested MKT on PSX (PlayStation One) and just curious. WHY there is bugs with distances in new fatalities. So it is NTSC-U version 1.0 and 1.1 (latest as I know). In both versions Smoke MK2 animality works in same distance as Kitana animality. (little step from "close") >>><Z. Same bug with Noob Saibot animality, its distance "close", and therefore bugs with animation. <><>Z. hmm but in v 1.1 enemy "lands" right in place. wait, in v 1.0 it is bug in corner. close distance it's OK. So, I think, we will make distances that we like, because distances in MKT (PS1) for new finishing moves just MAD. what is a function of this cheat? I think it's some kind of date. I know, but I don't have a clue. 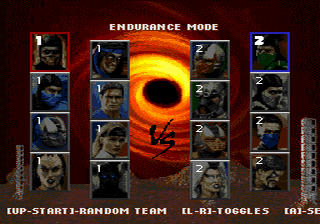 A, B, A, C, A, B, B is the blood enable code for Mortal Kombat 1 for Sega Genesis, what is this? I just performed it, it this code in the original Genesis version of UMK3 or did you guys add it r57shell? How did you find it Lindoloro? Now I understand, if you messed up, you have to exit Killer Kodes and go back and put the code in again, and its in the original Genesis version of UMK3 too, how did you find it Lndoloro? 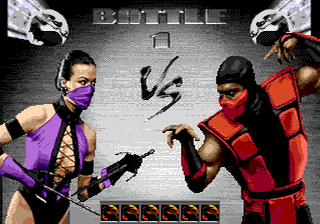 R57Shell How fix a kitana friendship in ultimate mortal kombat 3 original? All you have to know is n, m, d. No more comments about it, I said all I know. for what purpose? As I remember, just swap kitana fan special and friendship moves in movelist. для вызова имен достаточно нажать 13 раз A и 4 раза C. кнопка B не требуется. Об этом писал еще GManiac давным-давно. 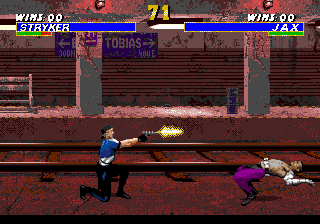 Для MK3 и UMK3 есть ещё секрет в Killer Codes, но он обеспечивается не комбинацией, а счётчиком: при нажатии A он увеличивается на 100, B - на 10, C - на 1. Когда он равен 1304, код срабатывает. Числа в десятичной системе. Когда заходим в Killer Codes, счётчик обнуляется. Известный код ABBADABBADUU, набирать при логотипе MK3, когда звучит гонг. Адрес $4E946. Известные коды ACUBUBAD, BADLADCRUD, CRALAUCRALAU, набирать на титульном экране. Адрес $4F2B8. Известные коды ACUBUBAD, BADLADCRUD, CRALAUCRALAU, набирать на титульном экране. Адрес $5D738. Известный код ADALARCUL, набирать на титульном экране. Адрес $5D865. Input on Start Game/Options screen. 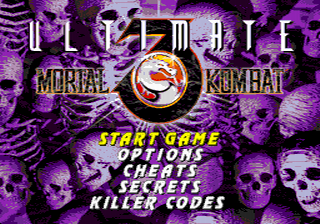 It is original cheat for all rows, but somehow they forgot to remove other 3 cheats from mk3 so they works too. Or... may be this cheat purpose was to open all 3 rows but they didn't done cheats input row by row as we do. Strange that it's missing in our movelist but there it is. I was just thinking about Cyber-Sub-Zero, I saw the video on Youtube of Nemesis playing as him I notice that he picked Classic Sub-Zero(Masked) to play as him, now I understand that he is a extra character and you guys are doing all the work, but from a story standpoint I think it would make more sense to have Sub-Zero(Unmasked) be the one you picked to play as him since that's the Sub-Zero the Lin Kuei wants to capture and turn into a cyborg for breaking their sacred code of honor. Guys, are you thinking about once the game is fully finished to open a site on here or a place like hacking-cult.org dedicated to the game and explaining all of changes and other stuff like the addition of Cyber Sub-Zero & Chameleon, the return of Sheeva, etc?